If there are a few parents and educators that “do more” be sure to thank them! FYI: When you log in from a computer you will have a choice of phone or computer audio. Join PA PTA Officers, National PTA Staff, and local PTA Leaders to discuss Relections, and so much more! Did you miss the 1/17/19, the 2/21/19, and/or the 3/21/19 PA PTA Video Conference? No worries. You can watch them anytime using the link below! And be sure to save the third Thursday of each month on your calendar! Then join Pennsylvania PTA for a Video Conference at 7 PM on July 18th; and August 15th, 2019. 2019 is an Election Year & Pennsylvania PTA Needs You! Delegates will elect members to the State Board of Managers at the Penssylvania PTA Annual Convnetion in October 2019. We are looking for qualified leaders to serve at the state level. If you have been actively involved in your PTA and are looking to serve in a different capacity, this may be the opportunity you have been looking for! Your kid is awesome. Smartphones are awesome, but awkward conversations about online safety and privacy...not so awesome! Until now. 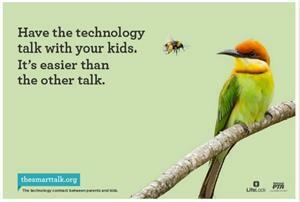 The Smart Talk gets parents and kids togetherto have a clear conversation about all devicesyou and your kids use and how to be responsible. All banner photos are courtesy of Lifetouch National School Studio, Inc.